SEATTLE, WA - There was a time when a dog like Max, a brindle Dutch shepherd with perfect pointy ears, would've made marijuana users paranoid. But Max wasn't at the Seattle CannaCon this week to sniff out marijuana, he was there to show growers how to protect it. 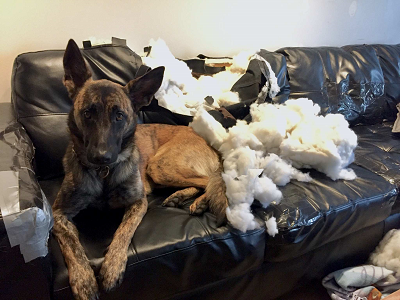 www.sunjournal.com wrote: The 2-year-old Dutch shepherd (Echo) has been in this situation before. He knows what he is about to be allowed — encouraged — to do. So when owner Rozalynn Parkhurst orders,”Get him,” Echo leaps forward to grab the padded arm of one of the instructors, growling and biting. /www.wtvy.com wrote: Deputy Steven Tector and K9 Drago earned their USPCA Certification for Patrol Dog 1 and earned national points. Drago is a six-year-old Dutch Shepherd and has been with WCSO for three years. Deputy Tector has been with the agency for 11 years and has been a K9 handler for three years. www.theoaklandpress.com wrote: He (k-9 Blitz) sniffed out illegal drugs, chased down fleeing criminals and — what may be considered the highlight of his career — located an Alzheimer’s patient who had been missing for several hours. For that, he received a lifesaving citation from Sheriff Mike Bouchard. On Feb. 19, the 9-year-old Dutch Shepherd died, about eight months after being retired due to illness. www.summitdaily.com wrote: The pilot program began in late 2015 with one dog, a Dutch shepherd named Sci, working with district wildlife manager Philip Gurule near Colorado Springs.